The play takes place on one evening in the home of Gertrude and Alice, which served as a literary and artistic salon for American ex-pats and European artists (see also Gertrude Stein and a Companion). 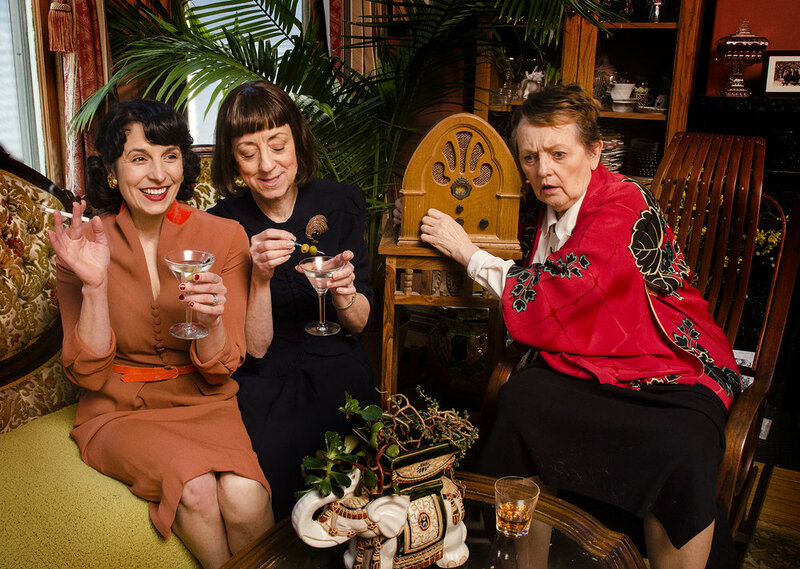 Alice reminds a grumpy Gertrude that she invited Agatha Christie over for dinner (and by dinner she means alcohol), and drops the unpleasant news that Agatha is bringing two American authors, Dorothy Parker and Lillian Hellman, who is a great frenemy of Gert's. But before they arrive, a woman who calls herself Mary arrives and asks for the agreed upon donation to smuggle Jews out of Germany, 150 Franks per person. Mary decides to stay and meet the writers, in the hope that one of them will write about the atrocities that are just beginning to come to light because, "we waste so much time being silent." After several drinks, served by the maid Bernadette, who has her own story to tell, the conversation turns heated as the women debate politics and art, among other topics. 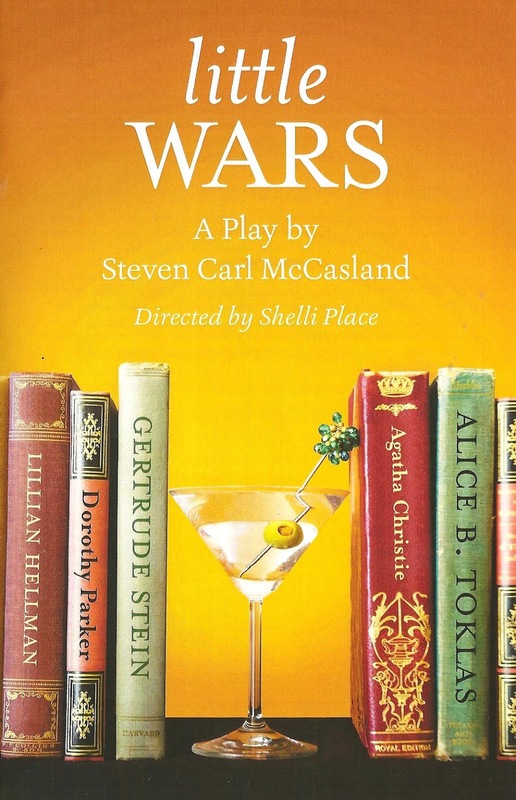 The play is really well constructed by playwright Steven Cal McCasland and well directed by company co-founder Shelli Place. There's never a dull moment as the conversation shifts and turns among the seven women, each of whom is a complex and fully formed character. This may be a historical play, but its themes are eerily relevant (as are most things post-January 20). Standing up for what's right no matter the consequences, helping those who are in danger, helping one or three or a hundred people even knowing you can't help everyone, joining together and supporting each other to make a difference, however small. These things all ring as true in the current environment as they did 77 years ago. It's such a thrill to watch a story told only by female actors, and grown-ups, and really talented grown-up women at that! Major props to Candace Barrett Birk who, on the first night I attended the show, had to stop mid-performance due to illness. But despite whatever issues she was fighting that day, she never lost the character for a second. The performance that night was cancelled, but she was back in the show just two days later and when I returned to the show for a second time she was in fine form, and just everything you'd expect Gertrude Stein to be. She and Sue Scott (APHC's loss is TC Theater's gain) as Alice B. Toklas have a warm and wonderful chemistry. Vanessa Gamble is kinda my favorite as take-no-prisoners make-no-apologies Lillian Hellman, challenging Gertrude at every turn. Also great are company co-founder Alison Edwards as the haughty Brit Agatha Christie who eventually warms to the task at hand; Elizabeth Desotelle as Dorothy Parker, hiding her pain behind alcohol; Laura B. Adams as the confident American smuggler Mary/Muriel; and the youngster of the group, Miriam Schwartz, bringing much pathos to the role of Bernadette. Set designer Meagan Kedrowski has created a busy and colorful playground for these women. The half-open walls of the apartment are covered with eclectic paintings, books are piled in every corner, and pages adorn the baseboards and floors. Andrea M. Gross' incredibly detailed period costumes, complete with adorable vintage purses and hats, are just smashing. 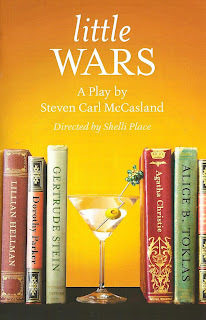 Little Wars plays for one more weekend only at Mixed Blood Theatre. Go support the work of female artists in their prime telling a story of historical female artists in their prime, in what is also an engaging and entertaining evening of theater. *Read my colleague Kit Bix's review on Talkin' Broadway Minneapolis to find out more about the historical accuracy, or lack thereof, of the characterization of these women.